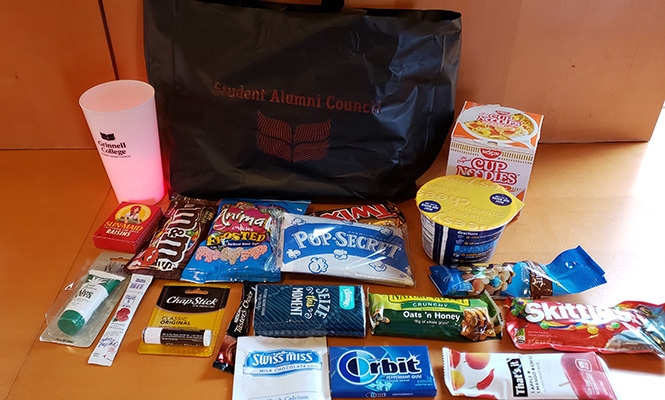 In anticipation of our spring semester final exams, the Student Alumni Council (SAC), in conjunction with the Office of Development and Alumni Relations, offers you the opportunity to send your student a finals care package. Each care package is $30. A list of sample items may be found at this link: http://sac.sites.grinnell.edu/calendar/care-packages. If your student has food allergies, we will be able to replace it with a suitable alternative. We also ask you to consider ordering an additional package for a student who might need a “pick-me-up” during finals week. Last semester, 116 students benefited from others’ acts of kindness. 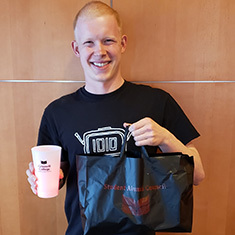 We work with offices across campus to identify students who will benefit from a kindness care package. With your support, we can continue offering this important program to our students. Once you complete the order for a care package, you will given a link to an online form to send a personalized message to your care package recipient. Orders placed after April 10 will incur a $10 late fee. Final care package orders are due April 17. Please note: Some versions of Internet Explorer may be incompatible with our payment processing system. If you experience an error, please try using Mozilla Firefox or Google Chrome. A sample care package. Items in the spring 2019 care packages may not be identical to the items displayed. Purchase a care package for your student below. Care package orders are now closed.